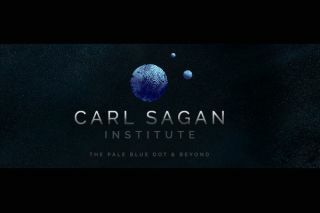 The Institute for Pale Blue Dots at Cornell University in Ithaca, New York,was renamed the Carl Sagan Institute: Pale Blue Dots and Beyond in a ceremony on May 9, 2015. The institute is dedicated to advancing the search for life in the universe. An institute dedicated to searching for alien life in the cosmos has been renamed in honor of the late astrophysicist and science popularizer Carl Sagan. Cornell University's Institute for Pale Blue Dots has been renamed the Carl Sagan Institute: Pale Blue Dots and Beyond to honor the legacy of Carl Sagan. At an inaugural event for the institute held today (May 9) at Cornell, Sagan's wife and frequent collaborator, Ann Druyan, revealed the institute's new name. "From the moment I first met astrophysicist Lisa Kaltenegger, the Carl Sagan Institute's founding director, I recognized one of Carl's kindred," said Druyan, who is also an Emmy and Peabody award-winning writer and producer. "It's thanks to her that his legacy is being given such vibrant expression here at Cornell." Sagan was a faculty member at Cornell beginning in 1968. He was the David Duncan Professor of Astronomy and Space Sciences and director of the Laboratory for Planetary Studies there until his death in 1996. Kaltenegger said it was Druyan who not only inspired the name change, but directly requested it. Shortly after the institute's founding in 2014, Kaltenegger invited Druyan to visit and speak to the graduate students and postdoctoral researchers who were being funded by the institute. "She's such an amazing person; I'd never met her before," Kaltenegger said. "And [talking to the students] she said, 'You know what? If Carl was alive, this is what he would love to do.' And then, she turned around and said, 'Would you mind naming it after Carl Sagan? This is exactly his vision that you're bringing to life here.' And there was kind of a pause, and I said, 'No, I wouldn't mind.' I was a little bit blown away. She said she was saving the name for something. And I was like, 'Wow.'" Kaltenegger happily obliged Druyan's request. The institute was founded with the goal of taking an interdisciplinary approach to the search for life elsewhere in the universe, according to Kaltenegger. Researchers who have joined the institute have backgrounds in astrophysics, engineering, geology, biology and earth science, according to the statement from Cornell. "We're basically pulling everything in. We're bringing a lot of very smart people into a room […] to address that whole overarching question: life on other planets, in our solar system and outside — how can we detect it?" Kaltenegger told Space.com. "The institute is basically an umbrella that facilitates it so that [those people] can all work together." Currently, the institute is funding a small group of undergraduate and graduate students, and postdoctoral researchers. Faculty members who belong to the institute already have established positions at Cornell. Kaltenegger said there are plans to expand the institute's funding, and to bring in members from other institutions. The institute has already produced a "color catalog" that could help scientists look for signs of life on alien planets. A planet that is dominated by a certain type of plant life or microorganism could have a distinct color signature that scientists could potentially observe. (Earth, for example, would have a green color because it is covered mainly by green plant life.) The catalog contains color spectra for more than 100 different life-forms and is the first catalog of its kind, according to Kaltenegger. The phrase "pale blue dot" refers to the appearance of Earth from afar. It originated with a photograph of Earth taken Feb. 14, 1990, by the Voyager 1 space probe from a distance of about 3.7 billion miles (5.95 billion kilometers) from Earth. Sagan further popularized the phrase with his book "Pale Blue Dot: A Vision of the Human Future in Space" (Random House, 1994). Other speakers at the inauguration event included David Latham, an astronomer at the Harvard-Smithsonian Center for Astrophysics; Aleksander Wolszczan, director of the Center for Exoplanets and Habitable Worlds at Pennsylvania State University; Bill Borucki, principal investigator for the Kepler mission at NASA's Ames Research Center; and Dimitar Sasselov, director of the Harvard Origins of Life Initiative.